Peter doesn’t figure out the sweet spot between doing nothing and doing something on the surfboard, until close to the end of the movie, but Kunu’s advice comes back to me a lot: Do less, do less. No, no, do more. It mimics an internal battle I have with myself sometimes. It feels like there are two sides of myself–one side wants me to have a calm, simple, orderly, life where I do less. The other side of me wants me to do more, learn more, tackle opportunities, get better, start businesses. The truth is, neither answer’s going to work completely for me or for our family. I’ve noticed something happening over the last two years, though. Since Mr. ThreeYear and I sat down and figured out this three year plan of doubling our net worth and becoming location independent, it’s been easier to pick and choose what we do. (Not looking at Facebook as much has helped too). Our values have become clearer and we have a better feel of what to pick for the wellbeing of everybody in the family. Part of that may be finally figuring out our kids a little bit better. Our values are: family, travel, financial independence. There’s an inherent tension in those three values. After all, any time we travel, we delay our financial independence a bit more. And sometimes we choose to travel without our kids, which works against our family value. But these three values do a good job of roughly encapsulating what we’re about, what we want our lives to say, and how we want to live them. We want a strong and functional family, so we devote time and resources to that. I volunteer as my son’s Destination Imagination coach (that’s a creativity competition) to give him lots of social practice in a safe, small group of kids (he struggles with that). We pay for piano lessons so our boys will know how to read and create music. We cart them to swimming and soccer for healthy bodies and a sense of self-worth. We also say no to more than one sport, or activities every afternoon. Same with travel. Last year, we took two vacations as a family to the beach. This year, we’ll take a big vacation to Chile for three weeks, a week at the beach at Spring Break, and a week to Maine this summer. That directly works against our goal of doubling our net worth in three years. Those vacations, especially to Chile, are expensive. But it’s important to us to see our family in Chile. To see our family in the Carolinas. And to build some memories of our own as a family. It also keeps us sane through the long New England winters. And to afford those vacations, we cut back in other areas that don’t mean as much–clothes, cars, housing. For financial independence, we sacrifice on the big things. We bought less house than we can afford and have a fifteen year mortgage. We don’t spend money on fancy reno projects, choosing to do as many updates as we can ourselves. We have older, gas efficient sedans. We bought them used and will drive them a long time. We max out retirement accounts before we spend the first dollar. We’ve systematically paid down debt. Our apartment in Chile will be paid off at the end of this year. We constantly work on getting better at our spending and saving (even when it feels like we’ll never get there). All those little efforts have added up, over the past nine years, to increasing our net worth from -$38,000 in 2008 to a substantial nest egg today. Maybe that’s just life. Maybe, like Kunu says, we’re eventually “gonna figure it out out there.” Somewhere between doing less and doing more, we’re trying to raise successful and happy kids, double our net worth, become location independent, live our lives, and not go crazy. Do less? 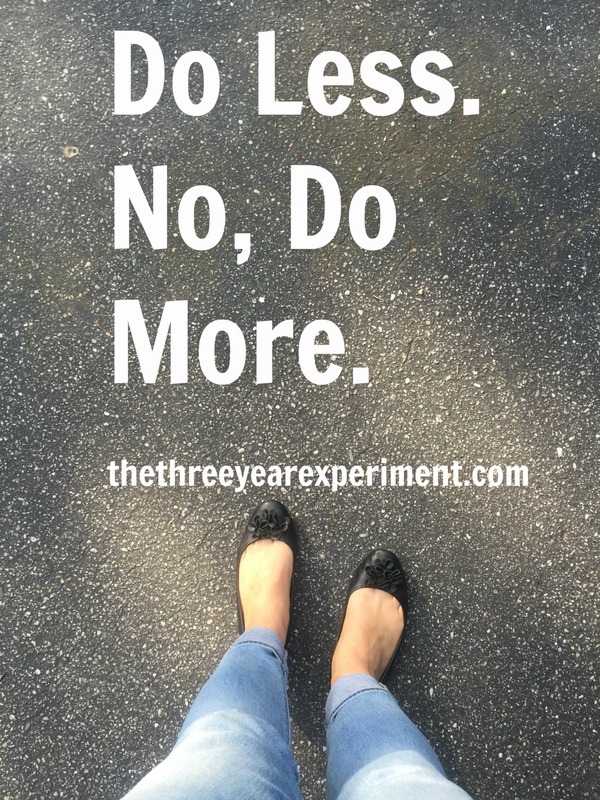 Do more? What’s your take?